"In 2004, I was the first patient in the world to use the Oncotype DX test to guide my chemotherapy treatment decision," said Katherine Young, a breast cancer survivor. "Standard assessments indicated that chemotherapy would be necessary for my treatment. However, based on my Oncotype DX Breast Recurrence Score result, my physician and I made the decision to forgo chemotherapy and its side effects. Fourteen years later, I am confident in my treatment choice and proud to be one of the million people who have benefited from Oncotype DX testing." "With millions of cancer patients around the world, it is critical to be able to individualize care. Oncotype DX tests have paved the way for precision medicine by providing personalized information based on the unique biology of every cancer, and by enabling confident, individualized treatment decisions. Genomic testing has become a mainstream component of cancer care, and patients are seeing the benefits through improved outcomes," said Harold A. Burstein, M.D., Ph.D., medical oncologist at the Dana-Farber Cancer Institute. Genomic Health's portfolio of Oncotype DX tests is supported by a significant amount of clinical evidence, including 125 clinical studies involving 140,000 patients and more than 150 journal publications. Recently, the landmark TAILORx trial was published. This trial used the Oncotype DX Breast Recurrence Score® to define, with precision, the individual benefit of chemotherapy for early-stage breast cancer patients. "We founded Genomic Health with the goal of improving the quality of treatment decisions for cancer patients by ending a 'one size fits all approach' with individualized and actionable genomic information to guide critical treatment decisions," said Steven Shak, M.D., co-founder and chief scientific officer, Genomic Health. "Our collaborations with physicians around the world, grounded in rigorous science with a focus on health outcomes, have now spared more than 1 million cancer patients from either over-treatment or under-treatment of their disease." The Oncotype DX® portfolio of breast, colon and prostate cancer tests applies advanced genomic science to reveal the unique biology of a tumor in order to optimize cancer treatment decisions. The company's flagship product, the Oncotype DX Breast Recurrence Score® test, is the only test that has been shown to predict the likelihood of chemotherapy benefit as well as recurrence in invasive breast cancer. Additionally, the Oncotype DX Breast DCIS Score test predicts the likelihood of recurrence in a pre-invasive form of breast cancer called DCIS. In prostate cancer, the Oncotype DX Genomic Prostate Score® test predicts disease aggressiveness and further clarifies the current and future risk of the cancer prior to treatment intervention, and the Oncotype DX AR-V7 Nucleus Detect™ test helps determine which patients with metastatic castration-resistant prostate cancer (mCRPC) are resistant to androgen receptor (AR)-targeted therapies. The Oncotype DX AR-V7 Nucleus Detect test is performed by Epic Sciences at its centralized, CLIA-certified laboratory in San Diego and offered exclusively by Genomic Health. 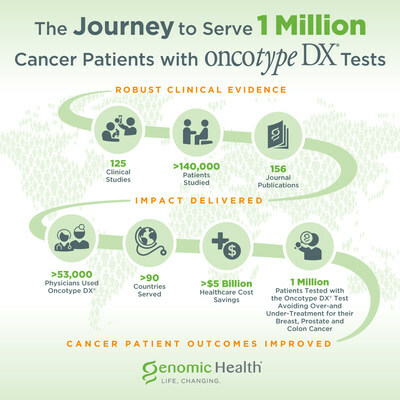 With more than 1 million patients tested in more than 90 countries, the Oncotype DX tests have redefined personalized medicine by making genomics a critical part of cancer diagnosis and treatment. To learn more about Oncotype DX tests, visit www.OncotypeIQ.com, www.MyBreastCancerTreatment.org or www.MyProstateCancerTreatement.org. Genomic Health, Inc. (NASDAQ: GHDX) is the world's leading provider of genomic-based diagnostic tests that help optimize cancer care, including addressing the overtreatment of the disease, one of the greatest issues in healthcare today. With its Oncotype IQ® Genomic Intelligence Platform, the company is applying its world-class scientific and commercial expertise and infrastructure to lead the translation of clinical and genomic big data into actionable results for treatment planning throughout the cancer patient journey, from diagnosis to treatment selection and monitoring. The Oncotype IQ portfolio of genomic tests and services currently consists of the company's flagship line of Oncotype DX® gene expression tests that have been used to guide treatment decisions for over 1 million cancer patients worldwide. Genomic Health is expanding its test portfolio to include additional liquid- and tissue-based tests, including the recently launched Oncotype DX® AR-V7 Nucleus Detect™ test. The company is based in Redwood City, California, with international headquarters in Geneva, Switzerland. For more information, please visit, www.GenomicHealth.com and follow the company on Twitter: @GenomicHealth, Facebook, YouTube and LinkedIn. This press release contains forward-looking statements within the meaning of the Private Securities Litigation Reform Act of 1995, including statements relating to the benefits of Oncotype DX tests to physicians, patients and payors. Forward-looking statements are subject to risks and uncertainties that could cause actual results to differ materially, and reported results should not be considered as an indication of future performance. These risks and uncertainties include, but are not limited to: the results of clinical studies, including the TAILORx study; the applicability of clinical study results to actual outcomes; the ability of the test results to change treatment decisions and improve patient outcomes; the risks and uncertainties associated with the regulation of the company's tests; the risk that the company may not obtain or maintain sufficient levels of reimbursement, domestically or abroad, for its existing tests and any future tests it may develop; the risks of competition; unanticipated costs or delays in research and development efforts; and the other risks set forth in the company's filings with the Securities and Exchange Commission, including the risks set forth in the company's Quarterly Report on Form 10-Q for the quarter ended September 30, 2018. These forward-looking statements speak only as of the date hereof. Genomic Health disclaims any obligation to update these forward-looking statements.